How Much Should a Small Business Owner Pretend? I’m a small business owner. My office is in my basement. The basement was converted into a two-room “in-law suite” apartment by the prior owners. 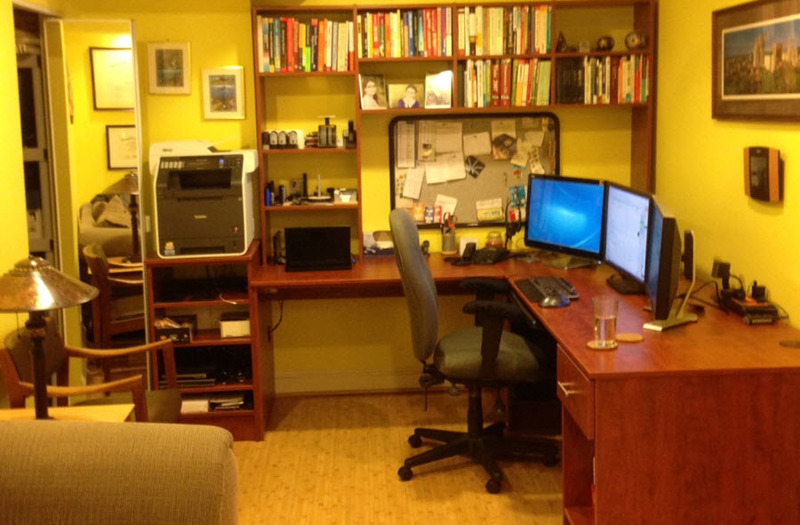 We use one room as my office and the other room as my wife, Aviva’s, office. We also have a conference table, a kitchenette and a door to the outside world. It’s an office, but it’s also part of my house. On an individual level, I don’t see much of a point in pretending to be larger than I am. I don’t have any desire to inflate my accomplishments or my background or to pretend that I have any skills or interests that I don’t. I am who I am. I have had more than one conversation recently with colleagues who also run small businesses. They tell me that they want to look professional; they work out of their house too, but that is hush hush. Their website is engineered to make them appear bigger. Maybe they have a P.O. box, or they have their real address and add a “suite” to it. Or they use a virtual address provided by a company like Regus. Nobody is supposed to know that they are working out of their house since, I’m told, if people found out, they wouldn’t want to hire this company to do their work. Is this true? If I tell my clients exactly what my business is and where it is located, will they not give me business? I don’t think so. Maybe it is true with some professions, or maybe not. I’m going to posit that in many professions, the benefit of being who you are, as an individual and as a business, outweighs the benefit that can be gained by trying to inflate one’s business or personal image. You’re going to slip. You shouldn’t pretend because you won’t be able to get away with it. I can think of one small business owner who inflated their credentials to include usability. When I asked them a question – not to test them, just because I was interested – and the answer I got back showed a serious lack of knowledge, I found that it potentially discredited their entire skill set. It’s harder to appear confident. Sure, you can try to appear confident in everything you do, but it’s a lot easier to be truthful and have a practice of being open than it is to always worry that someone will find out the truth and your business will go down the tubes. Being confident in what you say is a much bigger turn-on to potential clients than any kind of big office ego might be. You can be less threatening. I believe that not having a huge office and avoiding an image that I can do any kind of work for anyone prevents my colleagues from seeing me as a threat. And I much prefer being seen as a helpful colleague than a threatening competitor. Even the name of my company, “Lebsontech LLC,” is what it is. Nothing fancy, just a derivative of my last name. Truth be told, when I officially established “Lebsontech LLC” in 1997, I wasn’t yet confident that I could get enough work in usability, so Lebsontech also included additional web and data analysis offerings. I could have changed the name later on, made it something fancy that sounded bigger, particularly when I made it into my full time effort in 2008, but I elected not to. In all, I’m doing just fine being open about who I am – a small business operating out of my basement, not just “working from home.” I find work that I love doing, and I impress clients with quality deliverables. I have a small core staff as well as a number of available subcontractors, so I can take on large projects, while still being honest with clients that I’m happily working in my basement office. Have confidence in who you are and the scope of your business and others will too!